From Spanish Town, Jamaica. Born June 2nd, 1926. 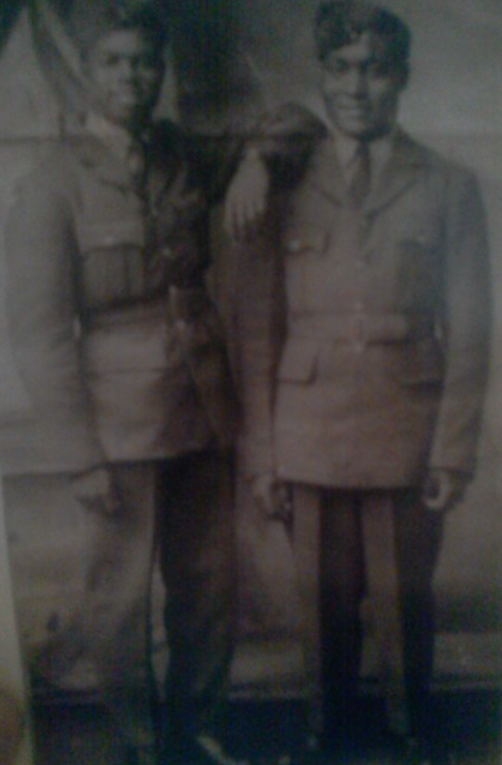 The soldier with his elbow on his mates shoulder is my dad! I don’t remember the name of the man with him. May be Percy? 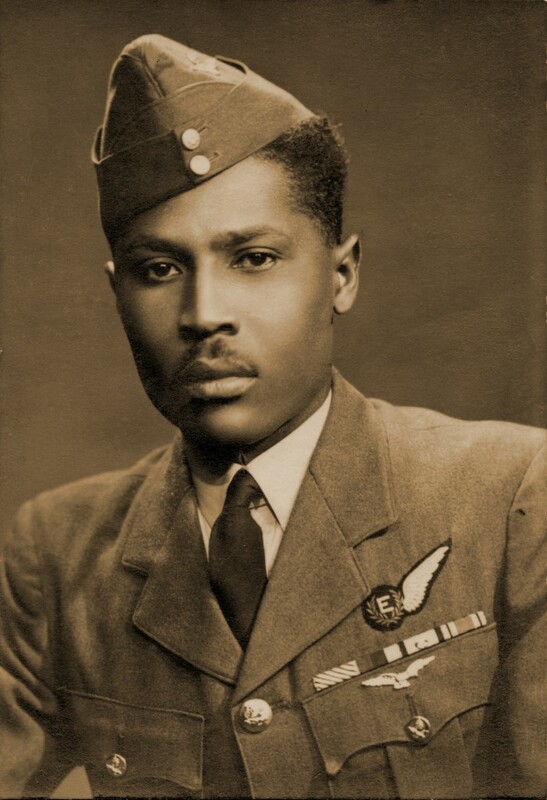 The son of a Jamaican father and an Antiguan mother, Godfrey Petgrave ​enlisted in the RAF in Lagos as his father was working in Nigeria at the time. 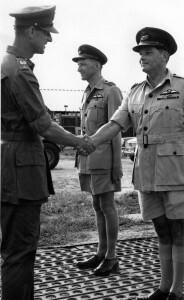 MARTIN, ALBERT WILLIAM Initials: A W Nationality: United Kingdom Rank: Warrant Officer Regiment/Service: Royal Air Force Volunteer Reserve Unit Text: 307 (Polish) Sqdn. 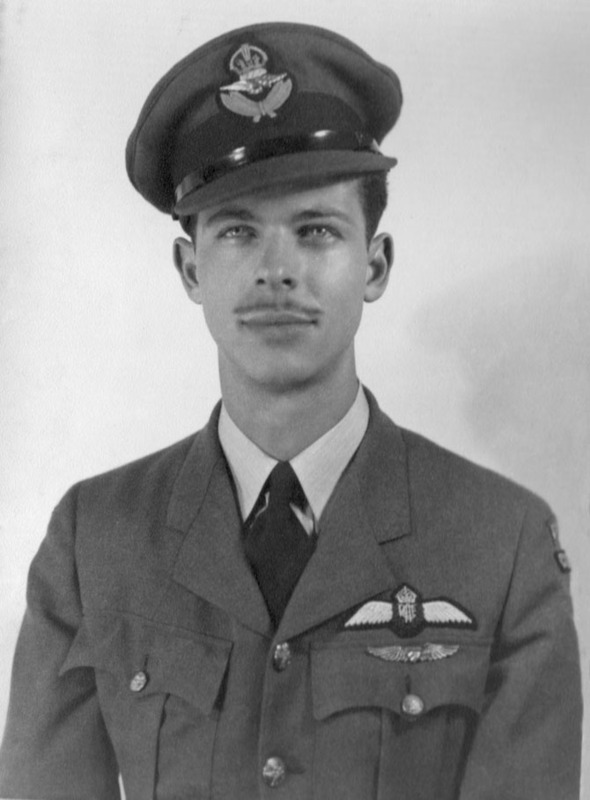 Date of Death: 05/01/1945 Service No: 1390553 Additional information: Course 3, ATS, Trinidad, trained in Canada, Pilot, served 68 sqn jan-Dec 1944, when posted to 307 Sqn on 12/12/44. 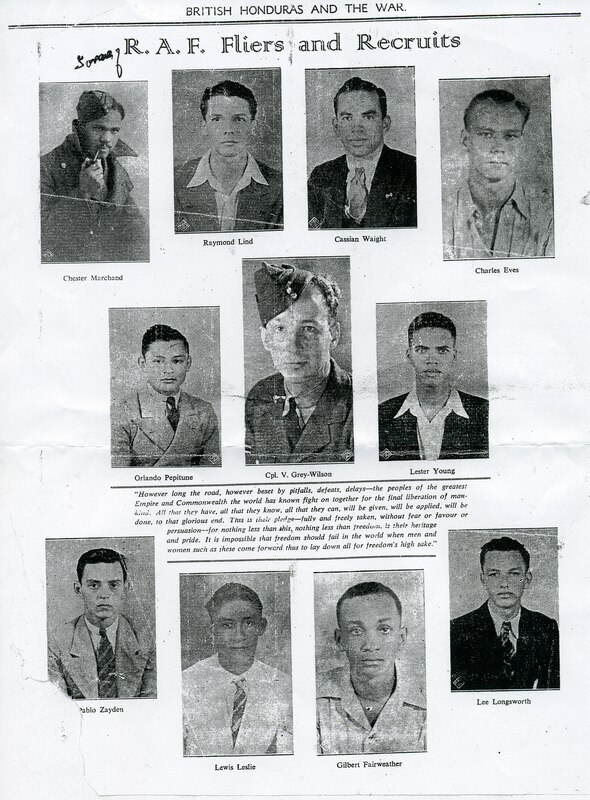 Miguel ‘Mike’ Enciso Seiglie, better known as The Lord, received four medals (see below) and a personal honor from King George VI for participating in sinking the German cruiser Admiral Scheer in the port of Kiel, on the night of 9 April 1945. In August 1942 Enciso departed from Cuba for Toronto and joined the Royal Canadian Air Force, where he graduated as a pilot. 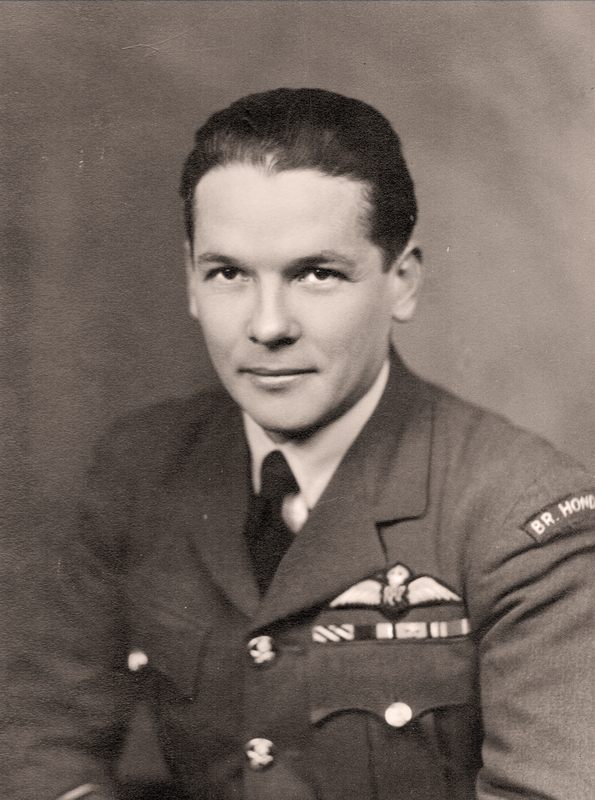 In January 1944 he arrived in Liverpool, England, receiving the rank of First Lieutenant with the RAF. He flew a Lancaster BX (built by Victory Aircraft in Ontario) in No. 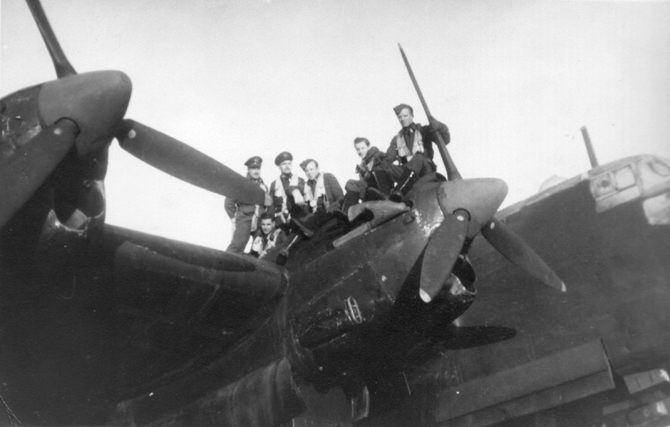 1 Bomb Group and flew missions over Berlin, Nuremberg, Kassel, Manheim and objectives in the Baltic Sea. On 14 March, a Messerschmitt hit Enciso’s airplane 16 times. In his book ’9050 Horas’ former Cuban Air Force General Del Pino relates the story of Enciso: ‘The bombers flew in close formation to defend ourselves better … seconds later I felt the rattle of my gunner Mark’s machine gun. I recognized him immediately because he had the habit of firing in short bursts at intervals. He was not one to pull the trigger and not let loose, but was a professional with incredible equanimity. The bomber flying to my right in the formation was hit by another Messerschmitt in one of the engines of the left wing. As we felt the explosion we saw one of the propellors come away from the engine and spin off. There was no doubt that this was the end of the aircraft. However, you always hope that the crew can bail out and survive as POW’s. We were close enough to see the Pilot and Copilot get up from their seats to leave the bomber, but the left wing broke off and the plane began to rotate uncontrollably along its longitudinal axis. Moments later another explosion disintegrated the plane completely. No one was spared. Events unfolded rapidly and you do not have the time to coordinate well what you do. I flet a blow to the tail of our plane and I thought it might have been some fragment of the other bomber that had exploded. Mark called on the intercom and told me we were hit and that a piece of aluminum tail had embedded in our left side. I no longer heard the characteristic rattle of his firing, so I worried more about that. He said he was bleeding a lot an felt very weak. We had already left the combat zone. 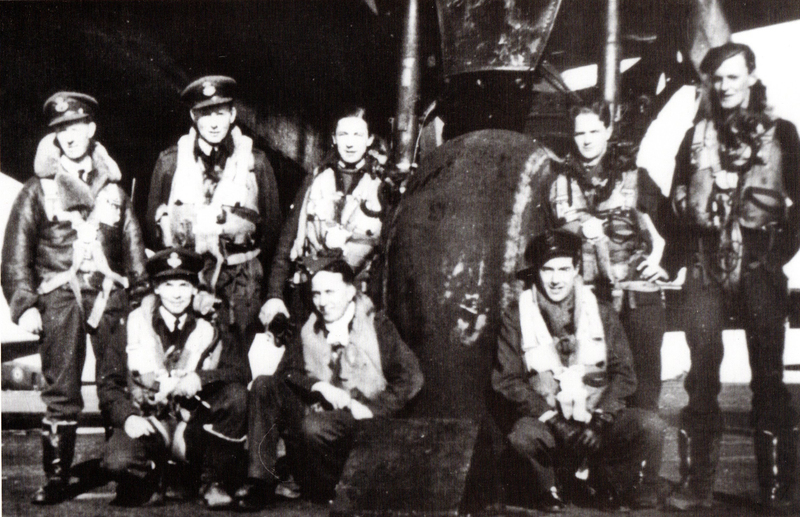 The enemy fighters had withdrawn, but it was still a little more than an hour flight. I was constantly calling until I stopped listening about ten minutes before reaching the airfield. When we landed, Mark was dead, had bled to death. On the night of 9 April 1945, a general RAF bombing raid by over 300 aircraft struck the harbor in Kiel. Admiral Scheer was hit by five Tallboy bombs and capsized. Medals and commendations: The British medal for Enlisted General Service (1939-1945), The medal Liberation of Germany, The French medal Star ‘for conspicuous value and service’ defending that nation, and the Voluntary Service medal from the Royal Canadian Armed Forces. Also he received a personal co-decoration from the King of England, King George VI, for single-handedly sinking a German battleship and thanking him for being a foreigner who risked his life fighting for Great Britain. There is an Acting Flt. Lt. Raymond Lind in 1945 mentioned on Forces War Records website, but it is uncertain if this is the same person. I notice from your website that there is an uncertainty about Ray Lind. I can confirm that he was indeed in the RAF during World War II, that he joined the RAF in 1942 from his home in Belize, British Honduras. He was with 199 (Bomber Support) Squadron in 1944 . . . mentioned in a book on the war-time squadron where Bomber Command launched an attack on Konigsbery and Settin on 29 August Ray Lind, pilot of Stirling aircraft LJ595 EX-N, section 1, part of a ‘windows’ diversionary raid. Also mentioned in October ’44 during the ‘Second Battle of the Rhur” again on a Diversionary Raid, dropping “Windows” around Brussels and continuing on to west of Frankfurt; return to their base at North Creake, Norfolk. Ray rose from Flight Sergent, Flying Officer to Flight Lieutenant. He was awarded the DFC on 17th July, 1946. His service number I think is: 170076. Additional information: Of British Honduras. 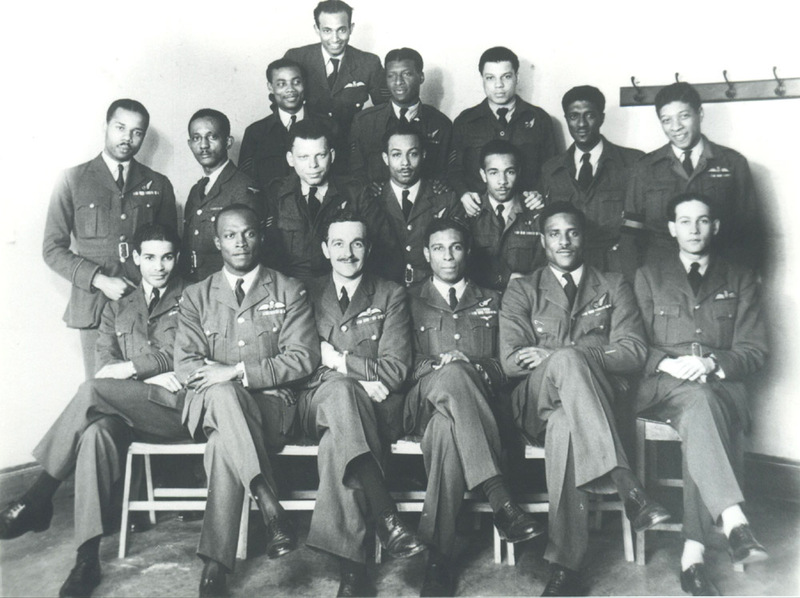 ‘As far as I know my granddad was born in Christiana in the parish of Manchester in Jamaica and moved to the UK to serve with the RAF – I believe he lied about his age so he could enlist! 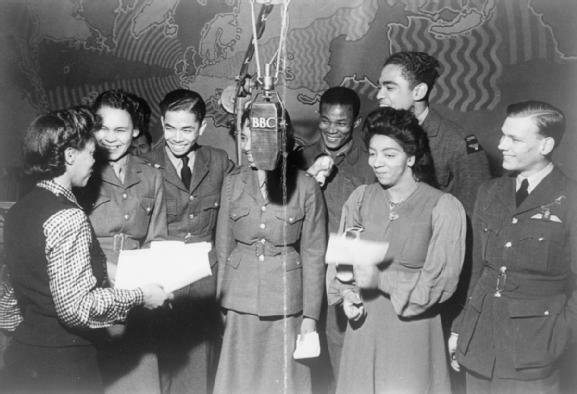 Servicemen and women from the West Indies pictured in a BBC studio broadcasting messages home on the weekly overseas service, 19 October 1943. 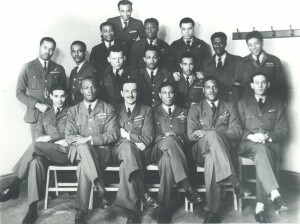 From left to right: Private Norma Marsh and Aircraftman Arthur Chin (both from Kingston, Jamaica); Private Nellie Forrester (from Montego Bay, Jamaica), Sapper Darnley Watts (of St Michael’s, Barbados); Nurse Vernice Lewis and Aircraftman Edwin Angus (both of Kingston, Jamaica); Pilot Officer Charles Egerton-Eves (of Stann Creek, British Honduras). On the far left of the photograph is Una Marson of the BBC.